IAB reader and an avid motorcycle and scooter collector, R Deena Dayalan shares a special story behind acquiring and restoring this little Luna TFR Plus. The previous owner of the Luna had fond memories with his prized possession and he did not want the vehicle (and the strong memories related to it) to go down to a scrap yard. 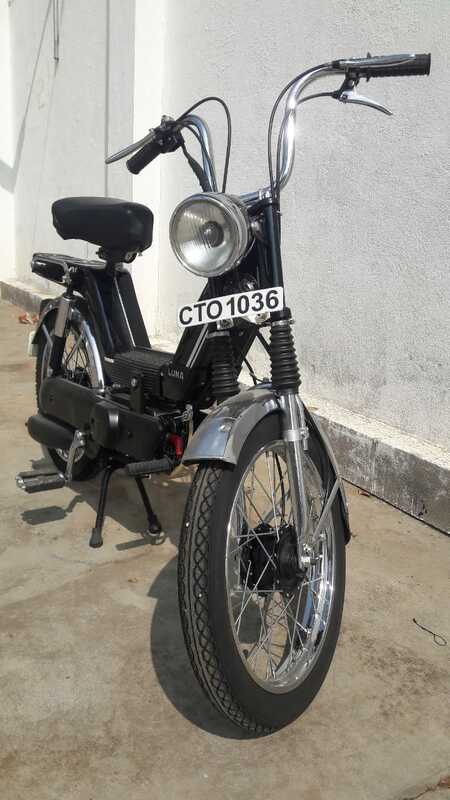 R Deena paid INR 3,000 for the moped and another INR 25,000 on restoring the vehicle. The previous owner of the Luna had fond memories with his prized possession and he did not want the vehicle to go to a scrap yard. Knowing Deena, and his passion for collecting two-wheelers, the owner decided to giveaway the Luna without asking money. However, after insisting, he agreed to take INR 3,000 for the moped. The owner was happy to part ways with his Luna as he was confident Deena would take utmost care of the vehicle. The Luna TRF Plus was in a bad condition when it arrived at Deena’s garage. Many parts were rusted and required replacement. After spending INR 25,000 on the vehicle, Deena was satisfied with the way the moped looked. 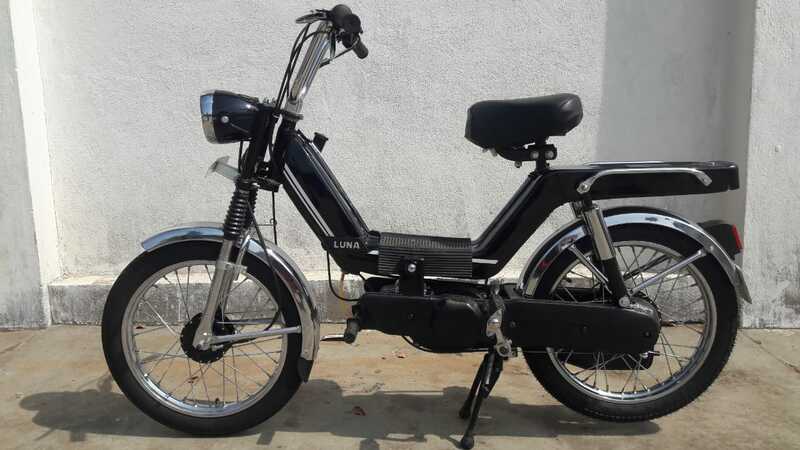 He shared the images of the restored Luna with its previous owner and you can only imagine the joy that he must have felt when he saw the moped. The black paint and the chrome panels shine just as good as a new. The spherical headlight gives it a proper retro look. The cockpit comprises a single-pod instrument console. The chrome bits on the Lune TFR include headlight mask, front and rear fenders, wheels and handlebar. A luggage carrier follows the rider-only seat. The moped came with a bicycle like pedals so that the rider is not stranded if the fuel runs out. The two-stroke engine on the Luna TFR Plus features 49.80 cc of displacement that churns out a humble 1.25 bhp of power at 4,500 rpm. Despite the low power figure, the lightweight Luna could reach speeds of up to 65 kmph. The moped rides on wire-spoke wheels and stopping power comes from drum brakes on both ends. The chrome bits on the Lune TFR include headlight mask, front fender, rear fenders, wheels and handlebar. We wish our reader many happy miles with the Luna and hope he makes many memories of his own with the humble little moped.